"A necessary structure for steam engines"
You can spend more for a fancy kit and spend time assembling little sticks, but I wanted to start somewhere fast. So I bought this built up by Bachmann. From a distance (and who is going to closely inspect your coaling tower) this unit looks just like the high priced spread. The only thing lacking was a little paint work on the two all blue figures and I was happy. I&apos;ll spend my time and money on more interesting features of my railroad. 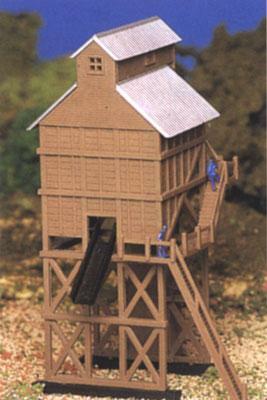 Coaling Station has several flights of very steep stairs, which feature two figures on them. Station is all brown with a silver tin roof and black coal chutes. "blue man group did a good job"